The need for groundnut researchers to uplift the livelihoods of smallholder farmers in Asian countries by devising strategies to combat soil-borne diseases and aflatoxins, was discussed at the 3-day international workshop organized by ICRISAT on ‘Management of Groundnut Diseases’. The workshop was organized in partnership with the Oil Crops Research Institute (OCRI) of the Chinese Academy of Agricultural Sciences (CAAS) in Hanoi, Vietnam on 12-14 May and was hosted by the Plant Protection Research Institute (PPRI) of the Vietnam Academy of Agricultural Sciences (VAAS). 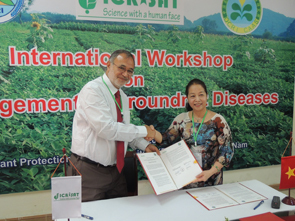 Dr Farid Waliyar exchanging the MoU signed between ICRISAT and PPRI-VAAS with Dr Pham Thi Vuong, Acting Director General of PPRI. At the opening ceremony of the workshop, ICRISAT’s Dr Farid Waliyar, reiterated the importance of groundnut as a major protein source in Asia and sub-Saharan Africa. Further, he explained the role of major biotic constraints, including aflatoxin contamination, in hampering groundnut productivity worldwide. He also affirmed the importance of training workshops and thanked the organizers of this workshop, the PPRI and the financial support from CAAS represented by Prof Liao Boshou. On the eve of the workshop, ICRISAT entered into an MoU with PPRI for mutual cooperation and agreement in research for development. A total of 35 participants (from Vietnam, China, India, Thailand, and Indonesia) shared and discussed the groundnut status reports from their respective countries. Drs Hari Kishan Sudini and P Janila from ICRISAT participated as resource persons. A field trip was organized on the third day for participants to witness peanut scab disease, an emerging groundnut disease in Vietnam. This workshop was organized as part of Window-3 bilateral support to the CGIAR Research Program on Grain Legumes.